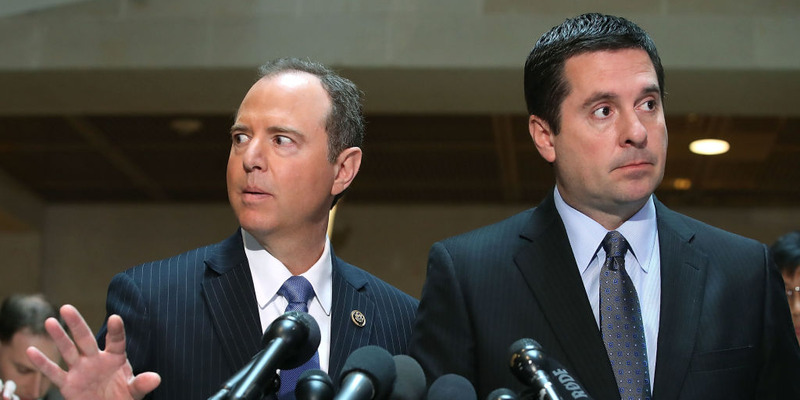 Mark Wilson/Getty ImagesThe House Intelligence Committee’s chairman, Devin Nunes, right, and ranking member, Adam Schiff. Rep. Adam Schiff, the top Democrat on the House Intelligence Committee, has accused his Republican counterpart, Devin Nunes, of altering a secret GOP memo after Republicans voted to release it, sending the modified version to the White House for review. The memo in question is believed to accuse the FBI and the Department of Justice of improperly surveilling a Trump campaign adviser during the 2016 election, and it is linked to a Republican-led effort to expose anti-Trump bias at the FBI and the DOJ. The committee’s vote on Monday to release the memo started a five-day countdown for the White House to decide whether to publish it. Schiff asserted that the modified memo delivered to the White House included “material changes” other committee members were not informed of and had no opportunity to approve. “This is deeply troubling because it means the committee majority transmitted to the White House an altered version of its classified document that is materially different than the version on which the committee voted,” Schiff’s statement said. Senate Minority Leader Chuck Schumer castigated Nunes over that revelation: “It’s clear that Chairman Nunes will seemingly stop at nothing to undermine the rule of law and interfere with the Russia probe,” Schumer said in a statement. “He’s been willing to carry the White House’s water, attack our law enforcement and intelligence officials, and now to mislead his House colleagues,” Schumer said. The Republican memo, which Nunes contributed to, is said to claim that top US law-enforcement agencies used the Russia dossier when seeking authorization to spy on the Trump campaign adviser Carter Page before the 2016 election. President Donald Trump and his allies have pointed to that as evidence of bias in the Russia investigation because the dossier was compiled as opposition research. Democrats have said the memo contains inaccuracies and aims to misrepresent the facts in the Russia investigation. They have produced their own memo in response. Trump has indicated he wants to approve the release – notably during a hot-mic moment captured immediately after he delivered his first State of the Union address on Tuesday night.